This wonderful release from FMP offers six extensive improvisations by the quartet of Paul Dunmall on tenor and soprano saxophones, Philip Gibbs on electric guitar, Neil Metcalfe on flute, and Ashley John Long on contrabass. Dunmall needs little introduction, the prolific reedsman has worked with the veritable who's-who of free improvisation in his renowned career, strewing the field with fantastic recordings over the past 40 years. Gibbs, another FMR regular, has been involved in numerous collaborative efforts since the early 2000s, and is a long-time colleague of Dunmall. The flautist Neil Metcalfe has participated in the Transatlantic Art Ensemble with Evan Parker and Roscoe Mitchell as well as the London Improvisers Orchestra and is a regular contributor to the European free music scene. The relative newcomer Ashley John Long possesses a highly skilled technique, a great ear, and an expressive tonal palette. From the outset it's worth saying that these men are not strangers. They have performed and recorded together in assorted combinations and exhibit a rapport that makes this album a genuine delight. The opener "Adonis Blue" churns with non-stop movement. Gibbs' rapidly expanding guitar figures intermingle with Metcalfe's strident, sometimes piercing phrases. Dunmall's tenor is big and sonorous, providing a rich contrast to the gauzy flute and guitar elements, while Long's bass playing offers a solid backbone for the improvisation, employing both arco and pizzicato techniques to great effect. "Azure Blue" similarly begins with guitar and flute, with Gibbs employing octave effects that makes the guitar lines seem to jump out of the speakers. Dunmall makes advantageous use of the reedier sounding soprano and provides a stiff accompaniment to Metcalfe's energetic runs. Long is equally percussive and melodic. He displays a resourceful dexterity and his playing really shoulders the improvisation. "Sea Escape" begins with a terrific 2-minute solo improvisation by Long in which he shows the range of his instrument with arduously rolling plucks and slaps. Gibbs and Metcalfe join in the brisk interplay as Long bows out measured lines of vibrato. Dunmall emerges shortly after, again on soprano, providing colorful timbres and biting pitch. The track grows more exploratory, the bass rumbling, the guitar in tangles, the flute fluctuating softly over top, and the saxophone discharging in fitful shudders. It condenses and closes in a whisper. Dunmall introduces "Colour of the Season" with an escalating soprano figure. Gibbs proffers his nimbly tapped and fingered patterns over which the flute chirps in tinny contrast. Long's playing is more textured on this piece, his curtly bowed shapes pushing through the dialogue as Dunmall shifts to tenor. Dunmall and Metcalfe provide an enjoyable exchange as Long throws deep swells and Gibbs' prickly guitar slows and releases some darker hues. The track ends in a subtle, anxious energy. 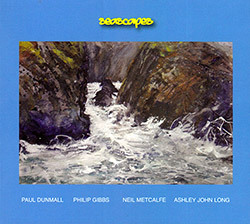 Metcalfe commences "Sea's Scape" with itinerant flute forms, delivering trilling birdsong as the strings fade in. Dunmall and Gibbs trade impressions as Long drives the invention ahead, with Metcalfe resurfacing briefly to close out the track. In "Green with Purple" the group closes the album with short combinations, first bass and flute, then guitar and sax before finishing out the album as a quartet, the horns ascending softly over the strings, as they clatter into silence. This is a masterfully crafted album full of motion, color, and contrasting moods. The performers exhibit excellent self-discipline, as the interactions are all exceedingly sympathetic. And while the playing is free, the quartet employs unseen cues, transitioning between the different instrument combinations seamlessly. The virtuosity and professionalism of the musicians makes this an exceptionally compelling listen, and in my opinion it stands as one of the best releases of the year.